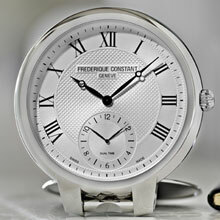 Frederique Constant has, in a relatively short span of time, become renowned for creating technically brilliant and visually stunning watches. Timeless in appearance, these watches are crafted from the finest materials known to man, coupled with scientific advancesmany of which have been developed in-house by passionate Frederique Constant artisans, engineers and craftsmenthat offer unsurpassed performance, reliability and durability. The resulting timepieces have seen the company rocket to the very upper echelons of the elite Geneva watch making fraternity. There is no danger whatever that complacency will set in; it's simply not in the nature of anyone connected with the company. Given the advances already made, however, it would be fair to ask the question, "How can they get any better?" This year, the answer has been... "Make it bigger!" All the skill and craftsmanship that go into every Frederique Constant wristwatch has been applied to the development of a stunning and all-new table clock. The glamorous clock incorporates all those characteristics that both identify Frederique Constant timepieces and at the same time ensure they will still look striking yet understated, modern yet timeless, and elegant without being pretentious, 100 years from now. Without question, the brushed and polished stainless steel case of the new Frederique Constant table clock would be an outstanding addition to any desk top. Rather than the square or rectangular shapes normally associated with table clocks, this unique timepiece is shaped just like a very large watch face, right down to the inclusion of a "crown" on the right hand side. Your eye is drawn first to the clock's face. Inside the gleaming, highly brushed and polished 94 mm stainless steel case is a stunning silver dial with a beautiful guilloché decoration. Large Roman numerals are printed around the dial, and the time is presented by hand polished, deep black oxidized hands. The clock contains two quartz movements, and offers world travellers a second time zone setting at the 6 o'clock position. Finally, you notice the clock's base, which looks for the entire world as though a giant strap should be attached there, but which instead is attached to the protective lid, which doubles as the watch stand. The new Frederique Constant table clock carries on the company tradition of providing stunning, premium quality timepieces at affordable prices. If you're looking for a Christmas gift for any man with a desk, look no further. 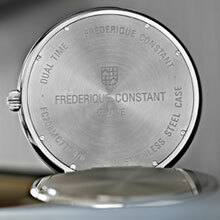 This exceptional addition to the Frederique Constant range is absolutely certain to please! For more information on the Frederique Constant table clock, please visit our website, or you can email the company directly at pedrini@frederique-constant.com.